This past Saturday was Free Comic Book Day, the annual celebration of comics and the shops that feed our favorite habit. Our intrepid Deadshirt comics reviewers braved massive crowds and hopped from shop to shop hunting for all the in-demand books. Here are our thoughts on just a few of them. The sweet spot of a Free Comic Book Day story is when a seasoned set of creators produces a funny, tantalizing, complete story in just a few pages—the elevator pitch of sequential-art creativity, if you will. 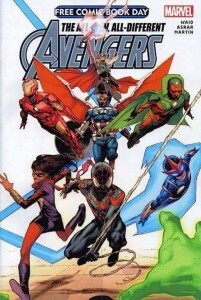 Mark Waid’s preview of the new Avengers is…not quite there, but the effort has been made. We are jumping forward to some kind of post-Secret Wars Marvel Universe status quo. 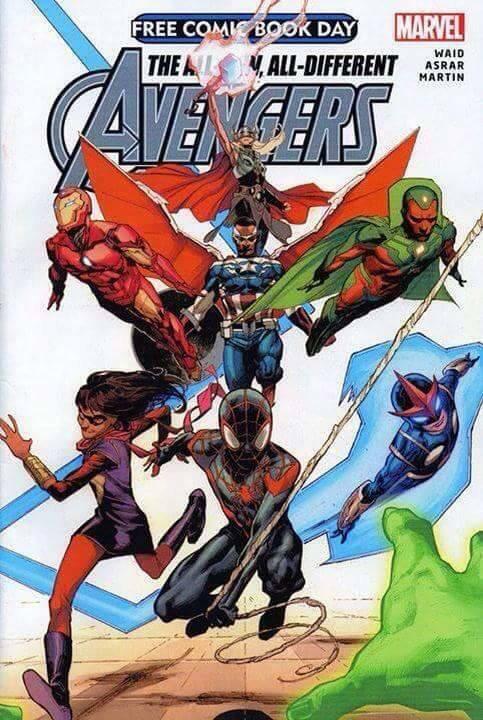 The Avengers now consists of four seasoned veterans (the Vision, Iron Man, Sam Wilson, and the new Thor) and three high school kids (Kamala Khan, Miles Morales, and Sam Alexander). Gotta say, I was really excited to see Khan join the Avengers, and even more so to see her revealed as this issue’s narrator on the first page. However, as a regular reader of Ms. Marvel, I think Waid is still struggling to find her voice. This is particularly a shame because this issue depicts her first encounter with some particularly violent death—a big moment for the character that is quickly pushed aside. Ultimately, Khan and my other favorite, Morales, could have been any young superheroes at all, as their voices are not distinct. Forgivable for a ten-page yarn, but disappointing. The story is by the numbers as well, consisting of the young members of the team being ordered into a dangerous side mission, believing that they’ve failed it, only to earn praise for their conduct instead. It’s not really any more fleshed out than one of Khan’s pre-superhero fantasies would have been. As excited as I was for a team that included Khan and Morales learning from seasoned heroes (not to mention Thor! ), I’m hoping this book is actually a poor preview of Waid’s planned approach. The Avengers are supposed to be an assemblage of capable heroes who get together when a threat is too big to stop on their own. In this issue they feel like an after-school club. Having different experience levels on the team is great, but four babysitting three is going to get old really fast. The issue is accompanied by another preview of a new book, The Uncanny Inhumans. It made even less of an impression, but it certainly solidified Marvel’s “Inhumans are the new mutants” approach, with a strike team following around reports of terrigen mist, recruiting promising heroes and containing those who lash out with their newfound power. DC’s more adult reader-oriented FCBD offering, Divergence #1, is surprisingly not about Shailene Woodley and unpronounceable dystopian housenames in a future time. Instead, we get three vignettes showing off some shake ups to the DC status quo: the reveal of the new Batman post-Endgame, a Superman whose identity has been blown, and a brand new character who is the progeny of a major villain. How’d they turn out? For the most part, real good! If there’s been a problem plaguing Snyder’s Batman tenure it’s that his arcs often feel derivative. Temporarily replacing Bruce Wayne with Commissioner Gordon, complete with a new Bat-suit that’s essentially a walking cop car, is certainly a new avenue. Capullo doesn’t get a ton to do here art-wise, but he delivers a haunting opening. Our first glimpse at Gene Luen Yang’s first Superman arc was the real standout of this issue, essentially a brief day in the life of an on-the-run Superman unable to hide from the public. Holed up in ratty motels and harassed by axe-grinding superhumans, Yang’s putting the Man of Steel and his supporting cast (especially Lois Lane) in places we’ve never seen before. It’s exciting, it’s kind of scary: in other words, it’s just what the main tier Superman needs right now. The final story introduces Darkseid’s half-Amazonian daughter, Grail. Yeah, I dunno. Still, DC seems committed to, in their words, “…preserving what makes our characters so iconic while never being too precious of the mythology…” I can’t wait to read more. 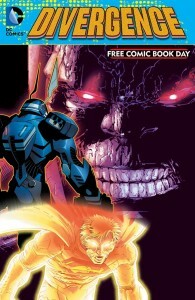 We can ascribe any higher motive to FCBD we want, but at the end of the day it’s all lightweight promo work. 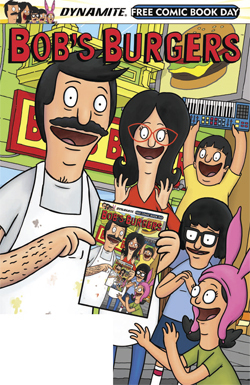 Such is the case with this Bob’s Burgers book, which features no original content and is instead something of a sampler of Dynamite’s recent miniseries, an issue of which we have reviewed. Indeed, the ad on the back of the comic is for the Bob’s Burgers trade paperback. This issue is a solid pickup if you’ve never read any of the comics before, and it does feature more substance than the average FCBD fare, but it’s redundant if you’ve already read the miniseries. It’s still good writing and good art, but it’s disappointing that there’s nothing new and/or exclusive. 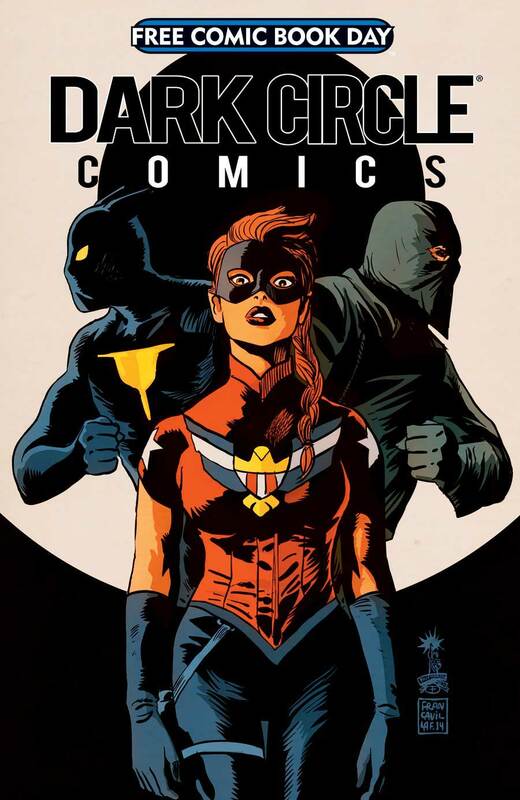 Dark Circle’s FCBD offering was a sampler pack of content about three of their biggest characters: The Black Hood, the Fox, and the Shield. It’s not overly thorough; the Black Hood story, which is the most intriguing of the bunch, is the prologue of the first issue of the series, as is the Fox story, which I reviewed when it came out. The Shield stuff is a series of process shots and backmatter. But what the issue may lose in terms of complete stories, it more than makes up for in its demonstration of the breadth of tone in the publishing imprint. I liked The Fox a lot because it had a classic, Silver Age feel to it, while still being modern. The Black Hood is a completely different genre, a gritty, bleak crime drama about a cop who loses everything in the line of duty. It’s a very different kind of story, but just as valid a take as anything else. The logline we’re given about the new Shield’s origin is great, and the art we’ve seen is dynamic and energetic. They’re all very disparate books, but they work in their own ways, and they’re broad enough to allow some potential (and seemingly inevitable) crossover. What did you pick up last weekend? Let us know below or on Twitter! ← Previous Previous post: Deadshirt Is Watching… Exes! Thrones! Leagues of Assassins!